Steve is the guy I found on Gumtrees who hunts down old trees that farmers want to gets rid of and rescues them from being put on a bonfire. He has a mill up in the hills where he cuts these trees into timber. All of the decking and ramps are made of his macracarpa pine, a naturally very oily timber that has a long life, almost as good as treated pine (I have an aversion to treated pine and only used it where absolutely necessary in the footings). These big old trees were used by farmers as windbreaks and many of them are coming to the end of their lives now so it is a good business for Steve. Steve also helped out doing the hard yakka of actually getting the timber off his truck, into a boat and stacked onto the island. At the end of one of these very long days he mentioned that he had a special stack of timber that he had been holding onto for years. He thought Picnic Island would be a worthy home for his 98 year old California redwood planks that had been air dried. 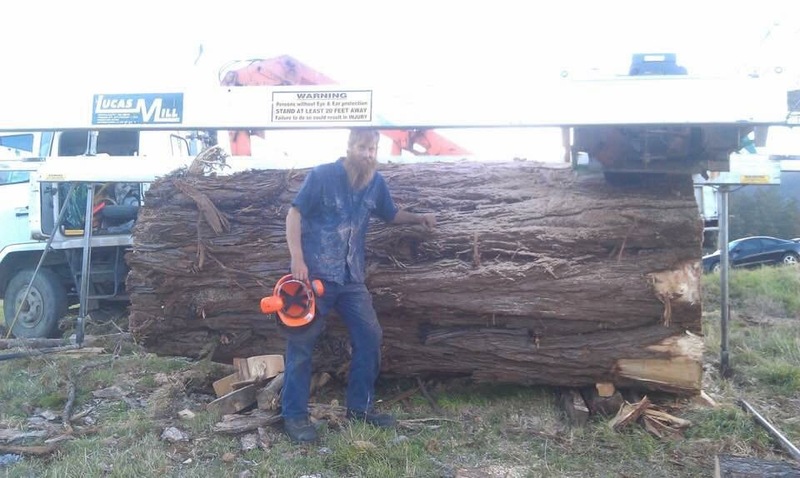 This was a tree that a farmer had offered him which is very rare in Tasmania (unlike in California). I grabbed what he had which was just enough to put down on the bedroom floors. It had been rough cut and to mill it into floorboards would have meant losing a lot of width. So all we did was get the edges milled to a straight line and laid them down. Not an easy task but my carpenter Bennie worked out a way to fix them. Builders hate working with materials that aren’t quite square or uniform but the end result is exactly what I was looking to achieve.